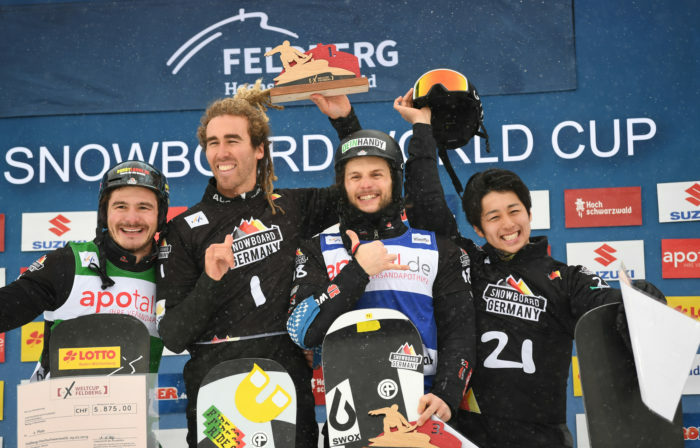 Australian dual Olympian Cameron Bolton (NSWIS) has claimed his first ever FIS Snowboard Cross World Cup title in Feldberg, Germany. The victory was even sweeter for the 28 year old who crashed on this course three years ago which resulted in a broken back. “It feels really, really good,” said Bolton of his first World Cup win. “It was a tricky race today and ’m happy I was able to come out here and do it. “Three years ago I broke my back on this course, so to come out here and qualify first and then take the win, it feels like I have a little bit of redemption. And to share the podium with a couple of German riders on their home turf is nice, too. “I took a lot of confidence out of qualifying in first, however I immediately shifted my focus to the heat racing, which was going to be another kettle of fish. “Everything came together and I had one of those days where you feel as though you can control everything around you. “I’m feeling great on snow and have a terrific team around me. I’m looking forward to building on this result,” he said.